Candied Chestnuts for sale. Buy online at Zingerman's Mail Order. Gourmet Gifts. Food Gifts. One French expat who used to work at our Deli told me he would crawl a mile on his hands and knees for these marrons glacés. You don't have to go to such extremes, but I'd definitely recommend trying them. 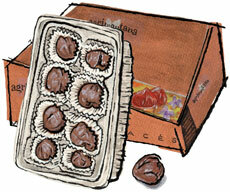 Despite the French name, Marrons Glacés are an invention of Northern Italy’s Piedmont region. Having tasted a whole bunch of them over many years, I can confidently say that the ones the Bardini brothers make near the town of Cuneo are my favorites. The chestnuts are aged for a week while submerged in water in underground caves. Later, they soak in a vanilla-scented sugar syrup bath, during which time the syrup is slowly pulled into the center of the chestnut. Finally, they're rolled in sugar and boxed. A surefire gift success with anyone of European origin and a great gift for chestnut lovers of any origin.